successful breeding...but now what? I have over 100! 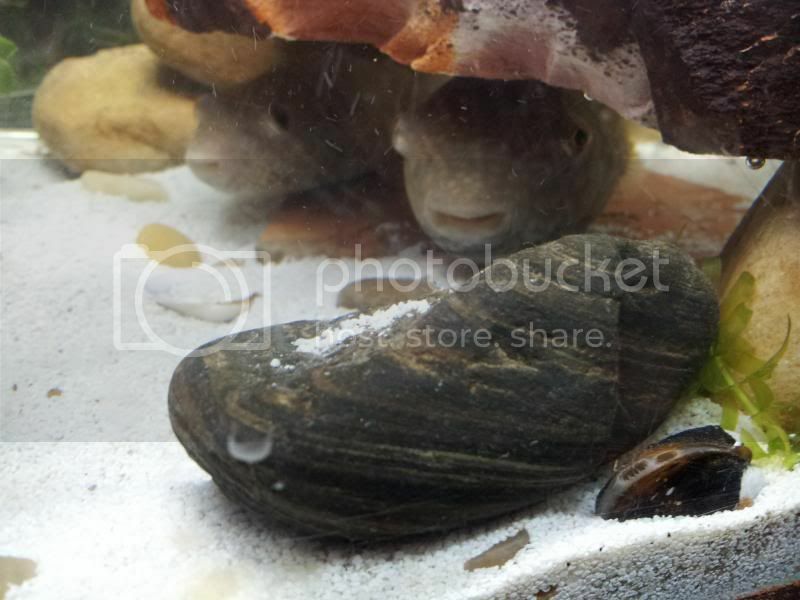 My Puffers: 2 Abei puffers (male and female couple! ) and many many babies! 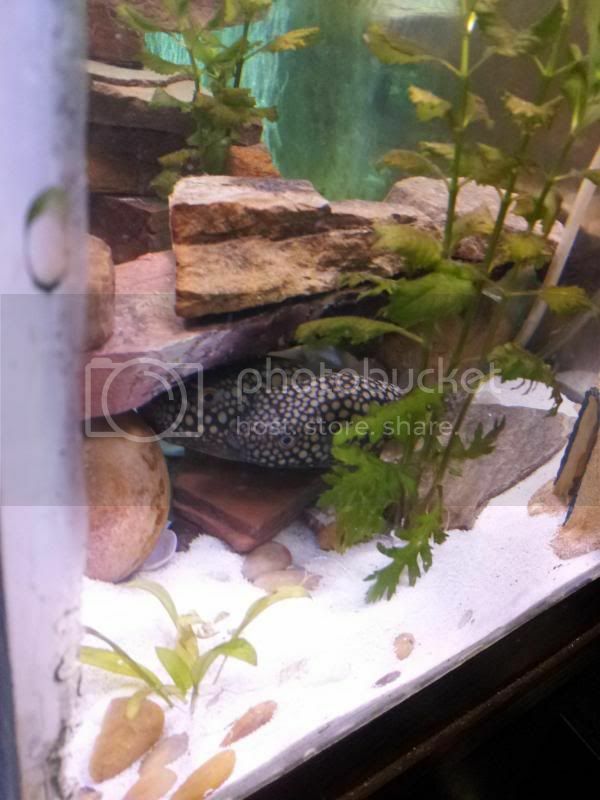 Hi, I came here last yr curious about 2 puffer fish I have. Not surprised that many here knew what they were but NO luck finding any good information on them! You type in what kind and before it was little to nothing but now I'm finding info THAT I POSTED! I'm flattered of course! 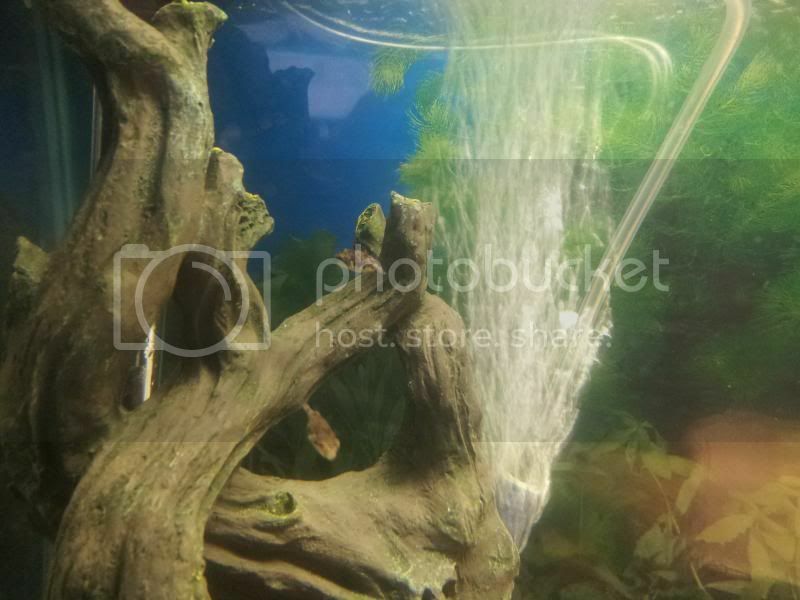 Even found my pictures on other fish sites! So to fill you in, I have 2 beautiful T.Abei puffers. They look a lot like red spotted but they have orange dots. Well I was lucky enough to end up with a male and female that mated...a few times! Not knowing much at all about the way puffers are with the eggs, I took the first batch out. I started with not quite but close to 100 eggs. ..over the first week I was losing a few almost daily! 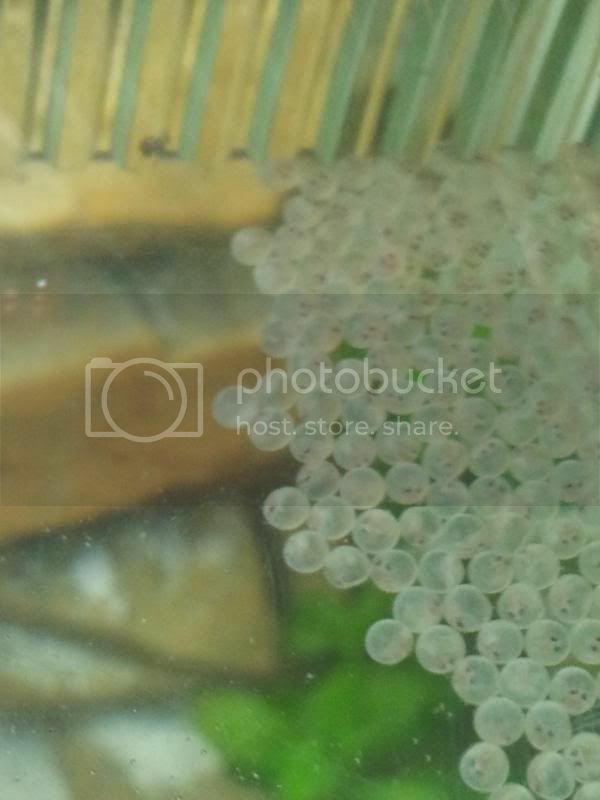 (I took them out the parents tank because all I mostly had angel fish and they ate the eggs and my guppies also ate the live babies so I wanted to be sure, remember I couldn't find info) anyway, I had 6 eggs that made it and started to hatch! Yes, only 6! 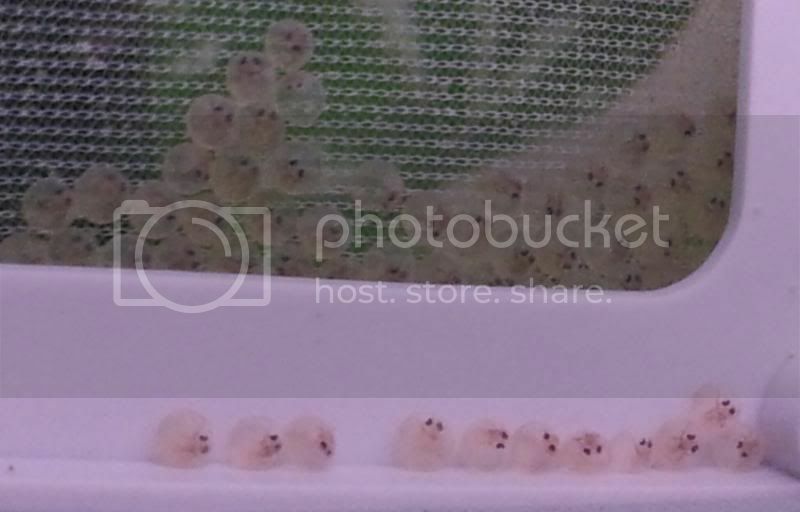 Well through that experienc *trial and error* I have 3 three month old healthy baby puffers! I found someone who does this q&a on a site and emailed him and despite not knowing anything about breeding Abei's, he really helped me with learning how to feed them and what not. Id like to somehow get info out there from my experiences watching these awesome fish mate and care for the eggs...I'll figure out how eventually. My issue is, since I was told its rare to end up with more than a few babies that make it.....I decided to let them mama and daddy puff) do their thing (I kept them from breeding because a week after the first batch that I took they were at it again! With hatching brine shrimp constantly, I couldn't handle more plus it was a disaster, ill explain another time) well I listened, I even let dad do his thing for almost a week then I took them because mating colors appeared! Now I have possibly over 100 eggs ready to hatch! All have eyes and everything inside the egg is visible (that's how I know they are live) so, what do I do with these babies? I know I can go to locally owned businesses but how can I advertise to locals and even further? If anyone has any ideas please let me know! Once again, thank you fo all your help! Oh if someone tells me how to post pictures, I have amazing ones id love to share! Re: successful breeding...but now what? I have over 100! Very cool! We do have a profile for that species here, in our Pufferpedia, under the Learn tab. There are also several folks who have posted here in the past who have kept the Abei--I'm sure if you did a Search, you'd find those. You have to upload your pics to a place like www.photobucket.com & link them to here. Please resize them 1st! FINALLY! I get to show off my beautiful Tetraodon Abei Puffer Couple! Daddy is the lil one in the front, trying to keep mama under the little cave so she can lay eggs for him! Dinner time! 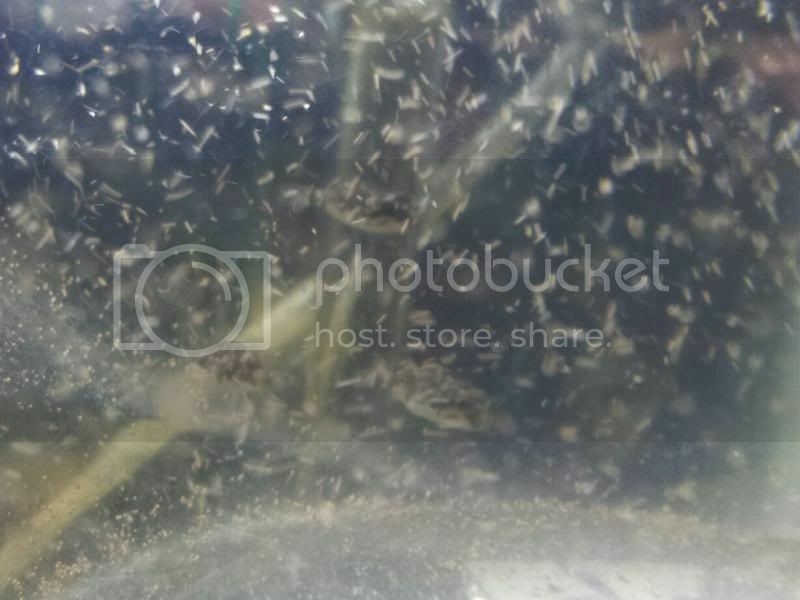 They are chasing baby brine shrimp I hatched for them! These lil ones are from the first time they mated! First successful breeding for me too! 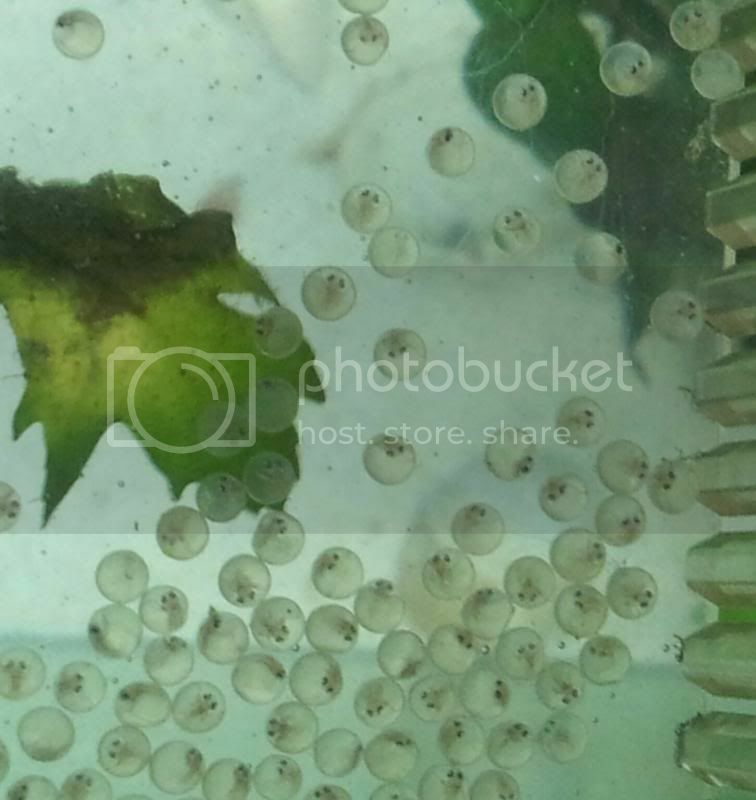 I took them early because I couldn't find much information on these puffers and breeding them in captivity seems to be unheard of so to be safe I took them. ..there were many, 3 made it! Almost 3 month after they hatched! I can't get them to stop breeding since the first time! This is the 3rd time! (Second time they had issues since mama is so big, the slate wasn't big enough...well daddy likes to rub all over mama during mating and he kept moving her over and over and the eggs fell all over! These are our new ones! A few days ago, you can see the eyes and lil mouth! This is one week after they were laid! Earlier this morning, the eyes are darker and you can see them starting to develope! A few hours later, you can see they are fully developed on the egg! Every now and again they spaz as they try to get out! Thank you so much for all the advice I've gotten from when I very randomly post on here! I hope I can help someone else that needs it! I had so much trouble finding out much on these and breeding being so rare, especially with me not even being close to an expert! I even came here but there just isn't much info out there! So hopefully this helps! Its an awesome experience having them and watching them! Keeping my fingers crossed that I have many many babies hatch and make it to adult hood! Thanks for letting me share this, hope you all enjoyed it! ...and sorry the pictures were so big... I'm on my cell and this post has literally taken me over an hr! Thank you so much for keeping such a great photo record of this! Love the mating colors & the lil egg-puffs are adorable! I always love to see the eyes in eggs, way more satisfying than livebearers. Has to be more gratifying with puffs. Awesome. Best of luck with them making it. Very cool and educational. 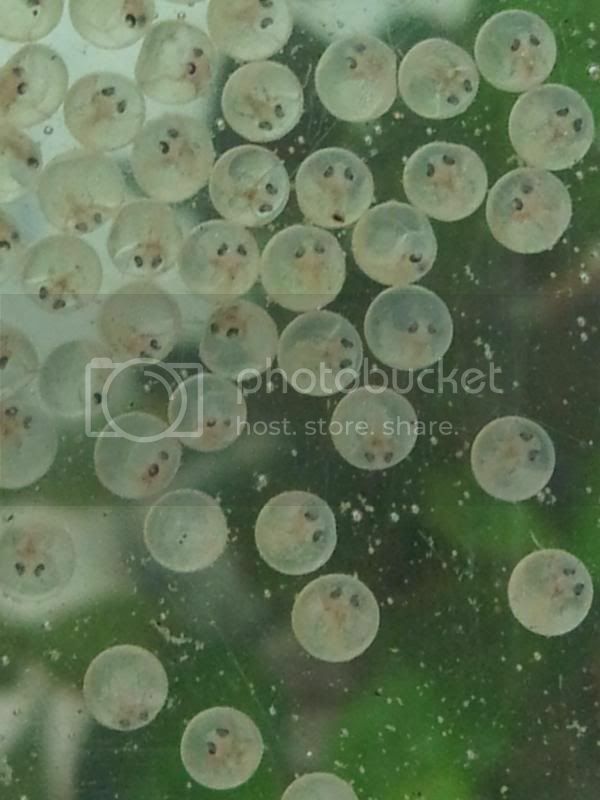 Thanks for posting pics - I'm sure many of us have never seen puffer eggs before, myself included. As far as what do do with the kids, I'd reach out to LFS' first. Abei's aren't the most common puffer in circulation, so surely someone would be interested in stocking some. You could also try craigslist and Aquabid. Good luck on this spawn; keep us up to date and don't be such a stranger! 10 points is the maximum amount I can award. Sorry. Great shots! And a great accomplishment! El Scorpio wrote: 10 points is the maximum amount I can award. Sorry. rotflmao... you get 13 from me!